This article describes the successful breeding of the BreedingTurquoise Tanager Tangara mexicana in an indoor birdroom in Canada. I was able to determine insect consumption up until fledging and also observe that the female incubated from the time the first egg was laid. The Turquoise Tanager has a wide distribution in South America east of the Andes extending from Colombia, Ecuador and Peril in the west, Venezuela and Trinidad in the north, and throughout the Amazon Basin. There is a separate population in eastern Brazil from Bahia to Rio de Janeiro that was considered a separate species (see comment by Isler & Isler, p.175 (1999)). Curiously enough T. mexicana is not found anywhere near Mexico. The head and throat and breast are metallic blue. This blue also occurs on the rump and lesser wing-coverts. The rest of the back, wings and tail are black. The centre of the breast, belly and under tail-coverts are a lemon yellow colour. There are five subspecies. Four of these - Tangara mexicana mexicanaT. m. mexicana, Tangara mexicana bolivianaT. m. boliviana, Tangara mexicana mediaT. m. media and Tangara mexicana vieillotiT. m. vieilloti - all have similar colouration, in particular, a yellow belly. Tangara mexicana brasiliensisT. m. brasiliensis, the subspecies from eastern Brazil, is larger than the others and is distinguished from them by having a white, instead of yellow, breast. A friend of mine who had both T. m. brasiliensis and T. m. mexicana, indicated that their contact calls are different. Tanagers are rarely available to private aviculturists in Canada. Having been trying for some time to obtain some Tangara tanagers, I jumped at the chance when I was offered a 'pair' of Turquoise Tanagers in late October 2003. Based on the descriptions in Nørgaard-Olesen (1973) and plates in Isler & Isler (1999), I believe that my birds belong to the nominate form T m. mexicana. All my birds are housed indoors year-round in a birdroom in the basement. The area of Canada where I live regularly experiences winter temperatures of -30°C (-22°F). The basement has in-floor heating so I can maintain a year-round temperature of 22°C-24°C (71.6°F-75.2°F). There is an electronic air filter running continuously to help clean and circulate the air. When the weather is not too cold I open the windows for fresh air. Humidity hovers around 50%-60%. I have tried using a humidifier to increase the humidity but it did not make a significant difference so I no longer use it. I have a separate area that is used to quarantine new birds. When I first received the tanagers, they were housed in a large cage 4ft x 2ft x 2ft high (approx. l.2m x 0.6m x 0.6m high) for 60 days quarantine before being moved into my birdroom. I had intended to move them into a large flight that housed a pair of Lemon-bellied White-eyes (Zosterops chloris) that had shown no signs of nesting for many months, but, when I went to catch them I discovered that they were sitting on three eggs. The only other flight I had available at the time was 2ft wide x 4ft deep x 8ft high (approx. 0.6m wide x l.2m deep x 2.4m high), so I put the pair in that. The pair immediately settled down, I find that birds seem to feel safer and are much calmer in tall flights where they can perch above my head height. The flight has natural branches near the top. Artificial plants provide cover. There is a feeding hatch 4ft (approx. 1.2m) off the ground so that I can feed the birds without entering the flight. I placed an open box full of nest material among the branches so the birds would not have to go down to the ground to collect nest material, I also constructed two nest areas carefully screened by artificial plants. The tanagers are fed my standard softbill mixture twice daily. The mixture is roughly one part diced tofu and three parts diced fruit. Ground up Mazuri low iron softbill pellets are added to the mixture. If too much of this is added to the mix it becomes a solid inedible mass. I have tried a number of different pellets but have yet to find one that the birds will eat willingly. The fruit normally consists of a base of ripe pear and apple, to which I add a two or three of the following: corn, peas, grapes, blueberries, zucchini (courgette), cucumber, peaches, melon and papaya (pawpaw). Once a week I add a scoop of Prime vitamins and a scoop of a calcium/vitamin D3 supplement - more often when birds are breeding. In the morning they also receive specially prepared sponge cake soaked in nectar. Boiled rice is added to the afternoon feed. As the birds are kept indoors, livefood is a challenge. I give waxworms, mealworms and mealworm pupae. Some years ago I tried two week-old crickets - the birds loved them but enough escaped and survived that we had crickets singing for months afterwards! Fruit flies present similar problems. I supply the tanagers with a few mealworms or waxworms daily but they show little interest in these when they are not breeding. 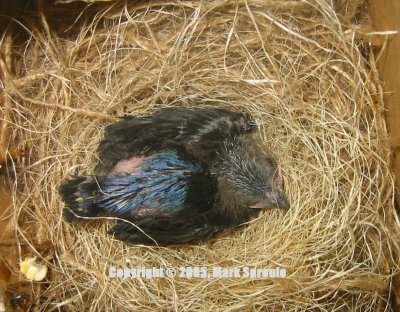 In early March 2004 I noticed that there was nesting material scattered about the floor of the flight. When I checked, I discovered that they had completely ignored my carefully constructed nest sites and instead built a nest in the box of nesting material. The outside of the nest was constructed largely of burlap strands and the inside was lined with sisal twine. There were two eggs in the nest, the normal sized clutch for tanagers. The eggs were white with brown markings concentrated at the larger end. The eggs measured 17mm x 11mm. I set up a wireless internet video camera, so that I could observe what was happening. These cameras are great, as you can hang them up anywhere and watch on your PC without disturbing the birds. I also use a digital camera to photograph nests - this allows mc to easily and quickly examine at my leisure nests that are in difficult to reach locations. When I checked the nest on March 19th, I discovered that it contained two tiny chicks. They were pinkish with a small amount of pale greyish down mostly on their heads and lower backs. I increased the livefood, providing them with freshly moulted mealworms, mealworm pupae and waxworms. The livefood was sprinkled with Prime vitamins and the calcium/vitamin D3 supplement. I was concerned because they were mainly taking just a few waxworms and mostly ignoring the mealworms. However, I checked the nest on the 21st, 24th and 28th and found that the young were growing well and figured that the birds must know what they were doing. Unfortunately, I had to go out of town for a couple of days at that point. When I returned the young looked quite well feathered and appeared fine. The next day though, April 4th, both young were dead. I had been giving the birds commercially produced waxworms and had been leaving them in the container they were sold to me in. I suspect that they had been contaminated. I now keep the waxworms on a waxworm growing medium and have had no further problems. In mid-April the birds tore apart the original nest and began building a new nest in the same location. After watching hours of video, it appears that only the female builds the nest. On April 22nd there was one egg in the new nest and on the 23rd there were two. On May 6th I checked the nest again and found one chick and one egg. 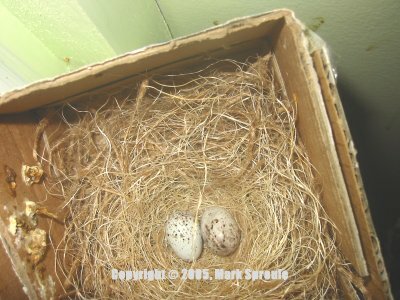 The following day the second egg had hatched giving an incubation period of 14 days. This pattern has been followed with subsequent nests, so I think that the female starts incubation following the laying of the first egg. At least this seems true of this species in captivity. I was again concerned by how few insects were being consumed and decided to keep a record (see graphs). On May 11th I found the smaller (younger) of the two chicks dead on the floor. On May 18th the remaining chick jumped out of the nest while I was changing the food dishes. I replaced it in the nest twice and on the second occasion it remained there. The following day it fledged at 13 days old. It was a dull bluish-black on the back and under the chin, the belly was pale yellow and there were some shiny blue feathers on the head. The rump was shiny blue similar to that of the parents. At this point the next problem presented itself. The chick could not fly vertically and wound up on the floor. The parents refused to go down to the floor to feed it. Each time I tried to put it back on a perch, it would immediately wind up on the floor again. I caught up the parents and chick and placed them in a large cage raised about 4ft (1.2m) off the ground. I placed a branch angled so that it touched the cage floor. This seemed to solve the problem. I continued to supply insects but the parents stopped feeding them to the young tanager as soon as it fledged. 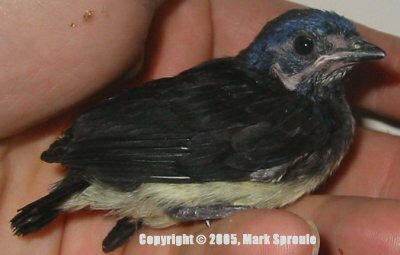 At six weeks the young tanager was almost as large as its parents and was feeding itself: I caught the parents and returned them to the same flight. Within hours they were playing with nest material. This time they re-used the old nest adding to it just a small amount of new material. On June 26th I checked the nest and found that it contained one egg. I checked again 14 days later, on July 10th, and found that the nest contained one chick and an unhatched egg. On July 11th the second egg had hatched. This supports my earlier observations that the female begins incubation following the laying of the first egg. On July 13th, I found the smaller chick dead on the floor of the flight. In the wild I think that these birds normally start incubation once the second egg has been laid and as a result the two chicks hatch at the same time. By beginning incubation following the laying of the first egg, the older chick out competes the younger one. The remaining chick progressed well and fledged on July 25th. Although it was able to fly better than the previous fledgling, I again moved all three birds into a large cage. At six months I had both offspring DNA feather sexed. The first is a female and the second is a male. By eight months they were in full adult plumage. I was surprised to hear the young male singing: as I have never heard the original male singing. The song is comprised of several contact notes strung together and lasts about five seconds. Breeding this species under controlled conditions in my birdroom allowed me to make some observations that would be difficult in an outdoor aviary or in the wild. I was surprised how few insects were required to raise a tanager chick to fledging, compared to other softbills which will consume as many insects as are provided. In captivity, at least, it appears that the female starts incubation following the laying of the first egg. I would be interested to learn if other tanagers share this behaviour. Isler, M. L. and Isler, P. R. 1999. The Tanagers, Natural History, Distribution and Identification. Smithsonian Institution Press, Washington, DC, USA. Kendal, A. and Lewis, E. 1994, Breeding Management of Four Tanager Species in a Mixed Species Exhibit at the San Diego Zoo, AFA Watchbird Vol XXI, Number 1. Nørgaard-Olesen, E. 1973. Tanagers. Vol. 1, Skibby Books, Skibby, Denmark. Vince, M. 1996, Softbills, Care, Breeding and Conservation, Hancock House Publishers Ltd., Surrey, BC, Canada.